Have you ever walked down a dusty, old country road with your arm stretched out and your hand up in the air, hoping that someone will ride down and pick you up? Neither have I. What I have done though is ride on these country roads in my friend’s Jeep, hoping to find the bonfire where the bluegrass band from my college would be playing (I know, but it was an extremely liberal college and a quiet Saturday). Took us a few hours, pitstops and lots of fighting to reach the destination. At one point we even had to stop and ask a man none of us understood for directions. When we finally did arrive the sun was setting and the small crowd was gathered around a bonfire. Out of the strange hush of college students unaccustomed to not talking, as we slowly approached them, rose the sound of a guitar that I did not recognize. It was unique, twangy, something I had never heard a wooden guitar make before. That day, looking to find cold beer and butchered, true American country, I ended up finding my first and best resonator guitar I’ve ever heard live. It is a shame that resonator guitars are not that often heard in modern music. The unique sound of this instrument is something that is unforgettable when played well. That night years ago the resonator played a long time and we danced a long time. So, in the hopes that maybe some of you will bring the instrument into the mainstream, I have made a list of the best resonator guitars available. 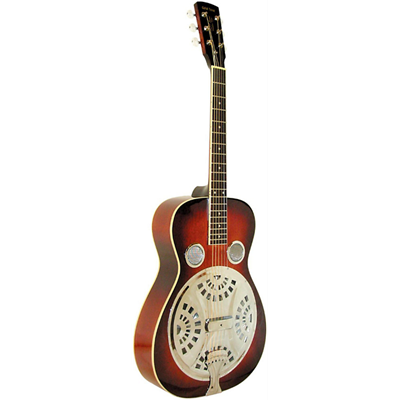 The resonator guitars have a long history deeply ingrained in the culture of the United States. They have been part of the soul of this country for long enough that they have undergone many alterations and changes. One thing remains true to tradition though – they sound as good as the first designs did. Just as soulful, just as twangy and country and the Gold Tone Paul Beard Signature Series PBS-M is not exception. The resonator in this guitar is slightly altered from the original single cones or tricones, but the sound remains just as rich, if not more so. The boy is made out of solid mahogany, lending the guitar a beautiful look, unique look. Tricone is a classical construction style among the resonator guitar traditions. It’s subtle, but warm and booming sound defined an era once upon a time. So it’s not a surprise that the modern guitar manufacturers keep with the traditions. The Regal RC-51 does so in the best of fashion, retaining the 75 year old traditions and combining them with the best ideas they could come up with. This guitar sounds like you have Bukka White’s spirit living inside of you, it sounds like the blues and the country that you imagine existed once upon a time. The traditional steel body construction gives the guitar an air of vintage. This roundneck guitar was designed to be played standing up, and it was designed to be look at in awe. The Recording King RM-991 might have an ambition for recording regality, but it shines most in its natural habitat of live performance. This guitar, with its slightly modified tricone construction, is brilliant in expression of the high tones and ambient in the expression of the lower tones. It is a strong instrument that brings music to tangibility by resonating the notes throughout its nickel covered brass body. The tricone composition is set in a unique manner, with two of the cones emphasizing bass through their positioning and one emphasizing the “solo” notes. 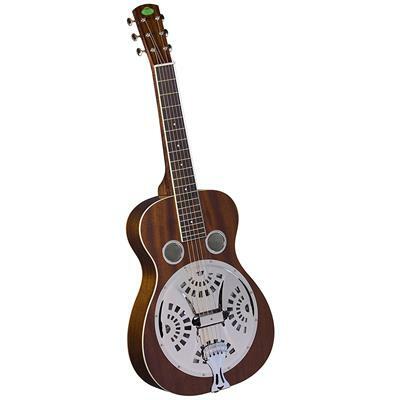 This is the perfect mid-range option among resonator guitars in terms of price, and it is an outstanding piece of musical equipment in terms of quality of make and sound. There are not many differences between the Gold Tone Paul Bear Signature Series PBS-D and PBS-M. Both guitars sound exceptional and look exceptional. There are some important distinctions though. Such as the fact that the PBS-D is a square neck, meaning more comfort when playing sitting down, as well as more stability. The PBS-D also means more affordability, though this guitar remains in the upper class of among the resonator guitars. The wooden body has a beautiful tobacco sunburst. As for the sound, well… this guitar sounds just like you wish you would sound when talking. It is smooth with a twangy southern accent, a deep bass that can travel up higher than the clouds in a split second without losing a single shred of credibility. An exceptional guitar. I don’t think country is steampunk. Nor are bluegrass or blues, but the idea of copper is. So why am I surprised when I look at the Dean Resonator Heirloom Copper and think of steam and goggles? Because this guitar is not just an instrument. It is an idea, an homage, to the old times, as much as it is a product of modern perfection. Dean Resonator Heirloom Copper is the embodiment of the sound that once was and the sound that people like you and me are chasing right now, something to bring a fresh breath of air into the modern world. With its single cone, the guitar sound loud and demands attention no matter where it is sounded. The round neck makes it easy to be held like a traditional guitar, showing off its beautiful look. It is an all around enticing invitation to listen and to remember something that could very well have not existed, but feels like was there. All resonator guitars are in a sense an attempt to allude to the past. Some build upon the past and develop new things, others assume what you might have imagine the past was like and build upon that. The Washburn R360K Vintage Series is a guitar that takes what was and make it again. The Washburn R360K vintage series stays true to the designs of the past, taking lessons from a century ago and learning them well. This guitar looks, feels and sounds like it was made in the 20th century, one of the original resonators ever made, but one that never rusted, one that never got old or took any wear. This guitar is a time machine to the birthplace of the Resonator, where Bluegrass and Blues and Country was just picking up the instrument. Despite the vintage style this is a very modern guitar and an outstanding one at that. Mix together metal, wood and a lot of love for the cigarette smoking, hard life living countryside of the 20th century and as an accident, add in a little bit of squareneck to the outcome. The result will be a guitar with a lot of character a lot of natural sustain. 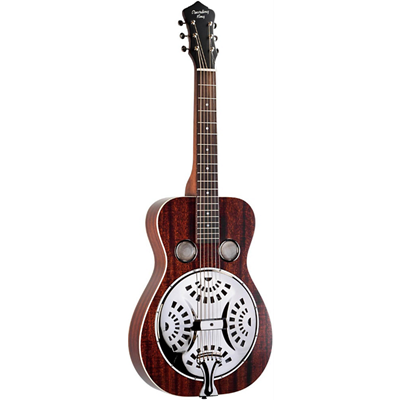 The Recording King Squareneck Resonator guitar is the spiritual successor to everything cool that ever was. The design of the cone maximizes the sound exclamation of the guitar while retaining the character and the pure sonic emotion. The two rounded sound screens add just a little bit of tremble to the sound so that what you get in the end is the instrumental version of the howling, haunting and beautiful voice of a man singing in the bar at the end of a long week. A needle in a haystack, something good to watch on Television, love and the meaning of life. All of these things are harder to find than a good, affordable resonator guitar. Thankfully, I have a lot of time on my hands and an obsessive compulsive disorder and have already found two out of the three things listed before. The Gretsch G9210 Boxcar Square-Neck is a welcome surprise and addition to the world of resonator guitars. Powerful and restless, its sound is like the sound of a locomotive, all engulfing and headed straight towards you. It is the steel horse, the bellowing monster that is to be respected by anyone who hears it. A combination of vintage and new, it produces the best qualities of a resophonic guitar while keeping it affordable. I think I might be in love. Whether you are an experienced player or a beginner resonant guitar devotee, you will appreciate the ability to sound professional for a fraction of the price of a professional resonator. The Regal Studio RD-30MS series squareneck is one of the rare specimens who will become your best friend on your road to becoming a professional resonator, be it for blues or bluegrass or country. The guitar is powerful and pleasant, just like sweet iced tea made by your grandma on a hot day. RD-30MS produces the hypnotic tones of the resonator while retaining the ability to sound refreshingly fresh and fast paced. 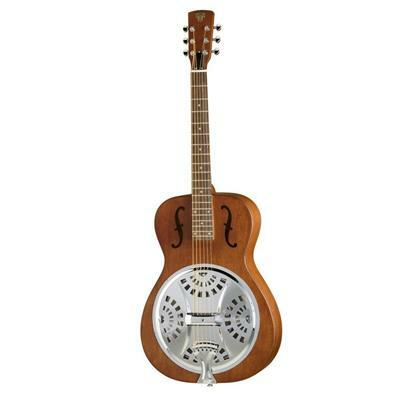 This guitar is one of the best resonator guitars under 500 you could get your hands on. Once upon a time the “Dobro” company created an outstanding piece of metal, one that could produce sounds never heard before in the world, the single cone resonator guitar. Today this guitar is known around the world by the name of its creator, Dobro. 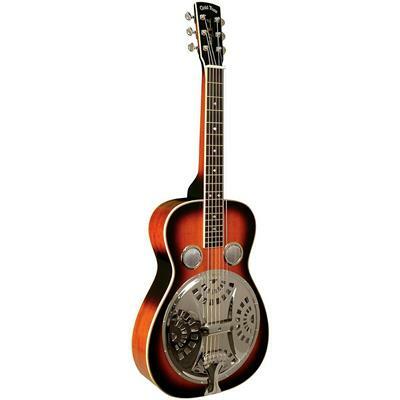 So when you hear that Epiphone made the Dobro Hound Dog Round Neck guitar, you should get up and start looking for a way to buy it, because it is an outstanding piece of metal. The guitar follows in the footsteps of the original design, born in the 1920s. The sound is exceptional, bending and expanding right below your fingers. This guitar, challenging like all resonators, is the apex of what the creator intended when creating it. The sound is powerful, the tone is unique, and the emotion is strong with this sonic marvel. The resonator guitar is, in essence, a steel body guitar with a spun metal cord or a few, through which he sound is resonated. Because of its unique build, the guitar produces a sound unlike that of a wooden guitar. There are several designs of the body and resonator of the guitar, which make a distinction to how the guitar is played or what sound it makes. So let’s not be shy and dive into the instrument. The origins of the resonator guitar, also known as the resophonic guitar, are similar to that of the acoustic-electric guitar. The traditional guitar was often being overpowered by the more booming instruments in the orchestra: the horns, trumpets, percussive instruments, etc.. The little experiment conducted by the creator of the resonator guitar succeeded, the instrument was much more demanding in an orchestra. Eventually the resonator fell short of the virtues of the electro-acoustic guitar and came into disuse as part of the orchestra assembly. Thankfully the very distinctive sound became prized by musicians in the Blues and Bluegrass genres. Today this is where you will find the guitar most often. 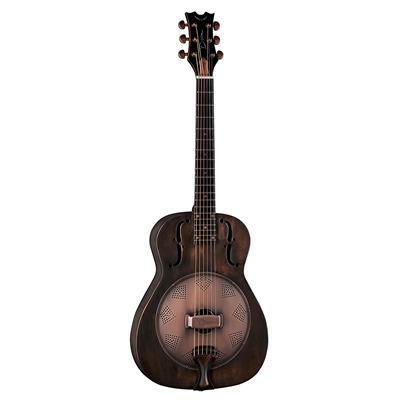 The first resonator guitar, the tricone, was made by the National String Instrument Corporation. The design was innovative and something not seen before, the brainchild of John Dopyera. The guitar quickly caught a following once it was developed. Eventually, because of some differences, Mr. Dopyera and his brothers left the National corporation. They started their own “Dobro” company and started producing the single cone resonator, which, being louder, ended up more popular. Eventually the Dobro company responded with their own single cone, by reversing the cone and coming up with a slightly altered design. This guitar produced a similar sound to the one produced by Dobro and remained single coil. Today there are many companies manufacturing the resonator guitar but all of them remain true to the single cone or tricone resonator designs. There are two main types of design that the guitar is built in. The square neck design and the round neck design, which have implications on how the guitars are played. There are two main types of resonators built: the tri-cone and single cone. Each one of these affects the volume and tone of the instrument differently. They all were also designed by different manufacturers at the time. The body of the guitar, contrary to popular belief, does not have to be made of steel. Only the resonator itself needs to be made of steel while the rest can be wood as well as steel. The guitar works by having the bridge transfer the strings’ vibrations into the resonator, producing the unique sound you can hear in the resonator. If you have ever listened to a resonator guitar, you will know that it sound very unique. 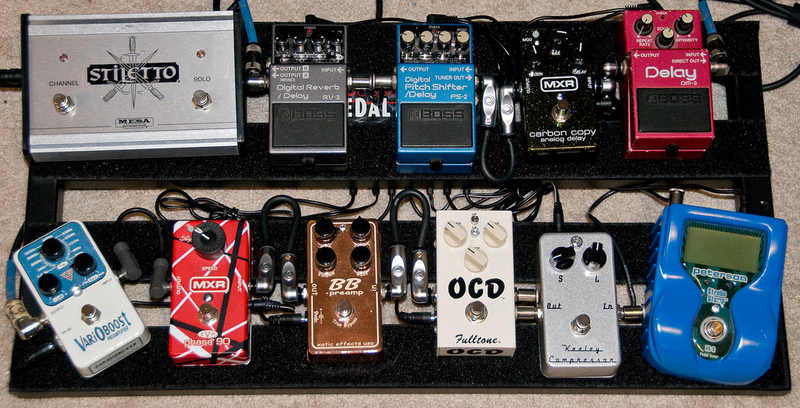 The tones have a tendency to have a very twangy sound. Something between a Banjo and a wood guitar, which makes it easy to understand why the guitar would find its place so easily in the world of Bluegrass. Whether played fast or slow, the guitar has the quality of heart breakingly beautiful sound. The sounds are very easy to fuse together, with many musicians using metal sliders along the frets to produce a pleasant sound effect. Tricone resonator is the type of resonator developed. It tends to have a more ambient sound compared to the other two options. It seems calmer and smoother in its sound, as well as slightly less loud than the other options. Single Cone is the second type of resonator ever developed. This version was much louder than the tricone. It also produced a more twangy, honking midrange sound, catering more to the needs of blues musicians. This guitar became popular as well, but the Tricone remained dominant in the market. The square-necked guitar has a more comfortable design to be played as a lap steel guitar. The square neck implies that the nut of the guitar is thick and square, meaning it is easier to be nestled in the lap of the player. The round necked guitar is designed to be easy to play both as a lap steel guitar or as a conventional guitar. The neck of the guitar remains thick to make the sliding technique preferred for steel guitars easier. The sliding technique of the guitar implies using the fingers of the left hand (or right, depending on which hand is fretboard side) to slide up and down frets as the strings are played. This produces a unique effect on normal guitars, which is enhanced on the steel guitar to sound much more prominently and pleasantly. It’s hard to forget the sound of the resophonic guitar spreading through the small field as I stepped out of my friend’s car. After spending a long time suffocating in the cramped space of the car, shared with people and luggage alike, it felt refreshing to finally step out. I did not expect to be welcomed by the beautiful sound of a fast paced resonator guitar though. The sound permeated my body, traveling from head to toe, bringing me back to life faster than I was able to walk through the field, towards the crowd of the wowed students staring, just like me. Two things happened that night (musically speaking, otherwise a lot of stuff happened). I learned of my love for bluegrass and I embarked upon my tormented journey to find a musician playing a resonator guitar in the modern world. Not that there are none, but there are not many, especially as part of the mainstream culture. It is a shame that my struggle persists through today. Which is why I hope you will heed my call and accept it, oh brave musician. 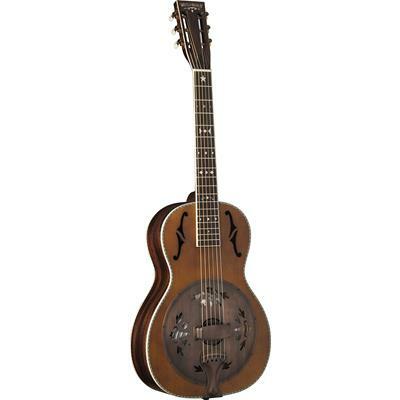 The resonator guitar, steel guitar, resophonic guitar so and so on, has so much potential for the modern world. 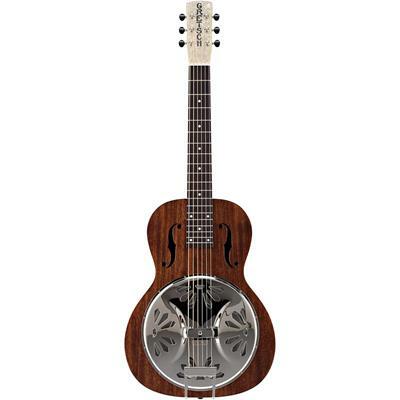 Go through this list, pick one of the best resonator guitars, and play it. Maybe I’ll hear you on the radio some day?